Cool. Although the scale creep is getting ridiculous. Just look as that Chaos marine behind the Land Raider. He's bigger the Bobby G! Crikey the scaling in that picture hurts my eyes and brain. Details bigger in the background than the foreground, the Land Raider is smaller than a Rhino, mein gott. Yep...that is not a good piece of art, lol. What you're looking at is a very small section of the Urban Conquest cover art that's smaller than the size of a postage stamp. Looks like a giant shoulder pad on legs. I've always been surprised by the lack of any Spider themed Chapter or traitor marines. Seems like a fun Chapter Symbol to design. Came for the tick, stayed for the art critique. You beat me to it, great minds think alike! Yeah, the perspective is fethed, but I'm pretty sure that in the full sized picture none of us would have noticed. Anyway. I think the spider looks interesting. As much derided than the daemon engines have been, I like chaos having their own things instead of just imperial stuff with spikes. It reminds me of the Blood Slaughterer from FW. So, a regular marine then? It may be a bad image but at least it isn't Blanche. Not to be a party pooper here, but how is this news or rumours? Am I missing something? Is this a rumour for a new mini? If so, cool, would like to see more like this. Art=mini, mini = art for GW. Just look at the Death Guard codex, nigh on everything in there is a representation of an actual miniature. It's terrible that Chaos is so neglected by GW, that people will find a drawing the size of a booger on some game cover and get excited over it. Plus, if any faction should be as broad and diverse as the Imperium, it should be Chaos, IMHO. We should have entire traitor guard armies. There should be a complete difference between "Renegade" and "Chaos" Marines. There should be 'bigger' Chaos Marines, about the size of Primaris Marines, with 2 wounds. Chaos should be as scary and have all the potential for soup as Imperium... but, nope. GW's position on Chaos seems to be "Make a dude every few years, put spikes on it or something, who gives a damn". Is it bad perspective... Or the non-euclidean geometries created by the influence of Chaos? And yet there were large Nurgle creatures in the art that never got a related model. Well we know that GW doesn't like to draw units that aren't miniatures, so perhaps this is a taste of things to come after Worldbeater or whatever his asinine name 80 days are up and Dooby comes looking for blood. More likely just another Daemon Engine. So who's gonna mail GW and say "We found the tick, time for the official reveal"
Yup, hence me saying nigh on everything. Still waiting for those gribblies from the Morty Vs G man art. But, I believe, that and a specific Chaos Lord are the only examples from that codex. I wouldn't mind a new daemon engine. Not sure I'd go the tick/spider route, but it's better than nothing. No-one has come up with the obvious name for it yet? I'm all for more Daemon Engines as long as they are more Daemon Engine, and less Daemon Engine. Let's face it, as clever as your names are, if this thing is real, it's going to have a triple- or quadruple-barrelled cluster-feth of a nonsense name. Bloodshriek Venge-Killer or Darkskuttle Slicer-Killer or some other such nonsense. We really need a new random GW name generator. Thank you for the reply. I didn't know that. I have been seeing lots of art that has no minis. I never knew this is the case now. So curious now, what are those 2 big huge genestealers now will be? Guess to head over to that thread and see what people say. I wonder when this mini will be announced or shown now. Its a chaos hermit crab, he's took up residence in a old chaos knight pauldron. its a classy house for the discerning hermit crab. Well done making me laugh! Though spending a few hours watching Super Sentai may have helped there. As far as the chaos tick thing is concerned, I'm curious to see if it's actually going to be something new for chaos or not. I can always use more daemon engines for my Word Bearers. There is indeed a good 2+ page discussion on it. Whether there will be a new unit, new aberrant style etc.. I heard a rumor there will be Black Legion soon with a new Daemon Engine, could be this thing. That would be a nice Death guard drone variant. It would seem a likely Black Legion equivalent to the blight hauler. Hopefully it will be a cheap easy build as well. 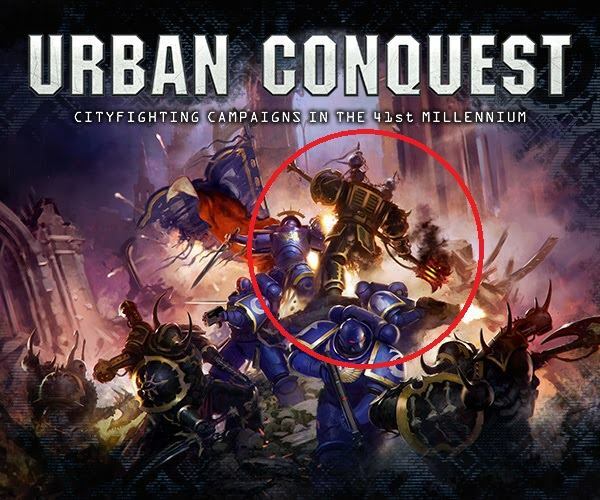 Semi-related question: Has anyone got a big version of the Urban Conquest cover art, like the whole picture? Enemy is half a mile away... better draw my combat blade. Whatever it is, it does look cool. I can hope that it's a new model from the Dark Mechanicum. maybe a bit bigger than a blighthauler and legged. Bring on the new daemon engines! Given that even some of the scenery in the larger version is comprised of GW kits, odds look good that the "Tick" is a thing. I cant tell if you're joking or not. That would be badass, they need lieutenants too! There's something in there that gives me an interesting terrain idea. I love that shoulder pads have now become so big and awesome that they've grown legs and sprouted guns! Those chaos marines are in the dark vengeance style, plus the same size as those primaris. Possibly a hq with a giant flaming mace? Sounds good. MIght be. Since the last supplement they pushed Black Legion towards elites, Chosen and Terminators. I'd put money on it being Blight hauler sized. Looks like a cool two handed mace! One of the more reasonable rumor mongers here on the boards has suggested new chaos terminators. If Chaos Terminators receive thunder hammer equivalents what will Chaos complaint about then?! We need to think about Chaos players! I hope it's just a new character. Don't really think that we need new Chaos Terminators that are for some reason even bigger than the current ones. Well Chaos Terminators are surely one kit that could go with a refresh. Also for some reason Chaos terminators have always been bigger than loyalist marines and by a good margin in all forms of media, comics, official art, videogames, etc... probably to make of them the "Big bad guy". Is not like their size has any consistence. Compared to what? Regular CSM miniatures? Berzerkers? Oblits or Havocs that don't even have plastic kits? GW knocked the Death Guard Terminators out of the park, and I'd be thrilled to see new CSM Terminators. They're looking very dated now and would only look worse when put alongside the new generation of chaos marines. Having no storm shields? see they can still complain about stuff. didn't chaos lords have 3++ with MoT? They all could do with a new kit. But whoever should the Imperium turn too in light of the nefarious chaos tick? That would be five kits, and I sure wouldn't be complaining! We have three already, although the standard Terminators are very dated. I wonder if there is also any new terrain previewed in that cover art, since most of it looks exactly like existing terrain kits. PLEASE give us a new terminator kit. Scale creep FTW. After the 6th edition chaos kits to now (Blackstone Fortress, etc. ), and primaris, all the old stuff looks awful to me. I've sold most of it off in anticipation of cool new stuff. Sadly, I assume it's just artwork. Hard to tell these days. For a minute there, it seemed like artwork only represented models. Now that isn't always the case. Death Guard have 2 terminator kits, so that would be 6. New termies would herald the end of everything. The new kit would likely not have the same flexibility of the current terminators and the forums would go up in flames at that point. Fair point. I'd rather have fewer options* and better models, personally. Not like I ever use terminators at this point anyway, even with all their cool options. *Assuming those few options aren't all total garbage. I'd be happy with any kits that Chaos get, tbh. Chaos Marines, Berzerkers, Terminators, Oblits, Havocs, etc are just so old and small compared to.. everything else. I'd also be pleased with some new kits like the rumored Chaos Tick. It looks awesome and makes me eager to convert some things. What I DON'T want is only new units. Please replace one or two of the old kits at the very least. Yeah it would be a terrible shame if this was just another wave of spikey Power Ranger zords. Honestly I'd just be happy if they gave that tentacle arm some sorta rule or profile for melee. Maybe something akin to the ability Wyches have with regards to stopping a fall back? Same - I've been waiting to update my BL with new scale stuff. I just can't bring myself to use mini-marines when it seems likely new ones are on the way. Is no one else thinking Dark Apostle? No backpack certainly leads us to think its a terminator. On balance, I am cautiously optimistic for a pretty major Chaos Space Marine release. We have Haarkon, the teased Dark Apostle/Sorcerer character with all the flaming skulls, and the 80 days Vigilus countdown. We also have all these unrepresented designs showing up in artwork. 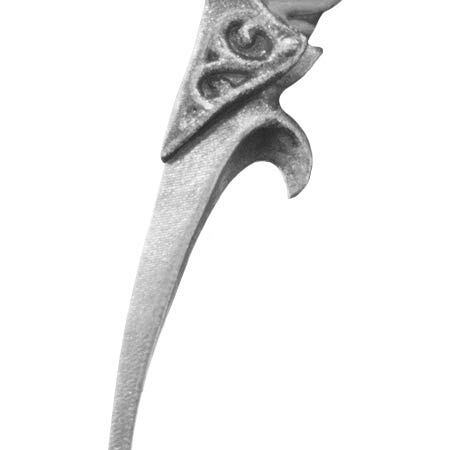 However, I am most reassured by the Rumour Engine pics. There are at least 4 that heavily suggest Chaos units (the probable Sorcerer backpack vent, the Chaos-y plasma cannon, the Chaos-marked tome, and the Slanneshi-esque pata-sword), as well as the flaming brazier. That is a lot of Chaos-related titbits. EDIT: also the burning skull in the 8-pointed star-ring. Taken all together, and I think we can expect more than just a token release. 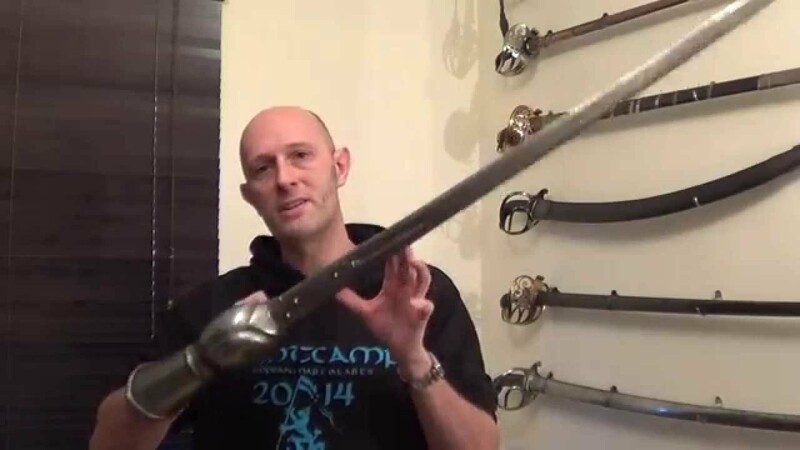 the slaanesh-esque sword was already confirmed as a Genestealer Cult bonesword. To me, this looks an awful lot like a part from a mortal Slanneshi infantry unit, maybe from AoS instead of 40k, but could be either (like the Tzaangors). It looks like one of the hammers from the dark apostle in Dawn of War 2. I mean, it isn't out of the question to eventually release a Dark Apostle in Terminator armor. We know plastic CSM Tacticals are coming soon. The first two sculpts are in Blackstone. Yes we do. It was confirmed by GW at the same event where Blackstone Fortress was first discussed that new CSM would be in BSF, as we have seen, and that a multipart kit would follow. Is that in the reveals from the event? Stated by GW in an event seminar. I just got out of the meeting. The Blackstone Fortress will have NEW CHAOS MARINES Vs Rogue traders (Think silver tower level models but 40k) and then they will be releasing them as multipart later, and the chaos release for next year involving Khorne and Slaanesh has models for both systems. Exciting times! They said there will be new CSM models in the Blackstone Fortress game, but not enough for a full squad, and that a multipart kit will follow to bring that style up to full size (10? number not clarified). Presumably next year but they wouldnt say. There's another source I can't find off the top of my head. But all of these were before we had any confirmation from GW that new CSM were in the box - we only had this trailer to go off - and everything they were told in the seminar has panned out thus far. How likely is it that CSM get a unique terrain piece of some sort, if they do get a larger release? The evidence is pointing towards a release larger than just a couple of characters, and all the previous releases of any note in the last year have had a unique terrain piece, both 40k and AoS. Therefore, I think it is plausible we will see one for Chaos. However, what I think is more interesting is the possibility we will see a more substantial Chaos-themed terrain line appear. My reasoning for this is not based on much more than a hunch, but bear with me. Killzone: Ryza Outpost (Genestealer Cults and Adeptus Mechanicus)- not yet released. There are also the Killzones included in Rogue Trader, which has entirely new factions and terrain to match. Notably, those are all the Chaos factions, and three factions known for opposing Chaos. I think that any parings between a Chaos and non-Chaos force from those lists would work. The thing is, there is currently almost no spare terrain that could be used to create a unique Killzone for them to fight over. The Ork Mekboy workshop would not be very fitting for any of the above races, nor would the Tau Tidewall terrain. I think one of the most likely options is to use the (now old) bastion, Skyshield landing pad, and Aegis defense line kits in some kind of stronghold Killzone. I say most likely because they use to sell a Chaos bastion, so the whole Killzone could simply be packaged with the Chaos vehicle accessories sprue to provide some factional flavour. It is possible than one pairing gets repackaged with the Sector Imperialis Killzone, to provide access to that outside of the core starter. There is also the Feculent Gnarlmaw and the Citadel woods, which perhaps could be used to create some kind of corrupted forest Killzone for the Death Guard vs X box. This would still leave one pairing out, even with some stretching. Another possible option is something along the lines of a Sector Manufactorum Killzone, which again would be stretching a little. Eitherway, nothing is particularly striking. Is this a coincidence? Perhaps, but I can't help but feel that there is going to be some kind of Chaos terrain release that could fill out a Killzone, and have two factions attached with some extra terrain. Perhaps something like a Chaos shrine Killzone, with two factions fighting over the tainted ground. Could be tied into some kind of "stop the ritual" narrative. From the Ryza ruins set, we have seen that Killzones do not need a huge amount of terrain to work. I think that new Chaos terrain is plausible. It doesn't block LOS at all, but I could see Thousand Sons and Harlequins getting the Eldar Webway gate packaged in for teleporting shenanigans. More generic Eldar terrain would be a potential for Craftworlds and potentially later Emperor's Children. Combine those and you can have a battlezone craftworld. Generic Chaos I could see getting some sort of defiled shrine terrain piece, like the old Eye of Terror polystone one. Grey Knights could use the same piece for a kill team. That leaves out Death Guard, but they can just have their Gnarlmaw tree and make it a single release or a third box for another release. More Aeldari terrain certainly seems plausible! If it came with a larger Aeldari release to flesh out/replace finecast for one of the factions that would be awesome. I was thinking Harlequins vs Thousand Sons would be the most classic match-up of the remaining 6. Perhaps the others could be Asuryani vs Heretic Astartes and Grey Knights vs Death Guard? There is also the Feculent Gnarlmaw and the Citadel woods, which perhaps could be used to create some kind of corrupted forest Killzone for the Death Guard vs X box. Make that a Death Guard versus Craftworlders pairing (defending a Maiden world) and GW couldn't just add the Webway Gate, but also bring back the out of production Rhino in blasted forest. You know, trees because that's the theme and a Rhino because Chaos uses them. Would be easy to fill a Killzone box with, and use the more generic Forest and Gnarlmaw that are useful in larger numbers for the Kill Team boxes. So far, only the Deathworld terrain has any sort of 'xenos' or non-imperium terrain. It'd be great to get more xenos terrain and something for chaos, especially if it's as modular and customizable as the current terrain kits out there. The way I see it, a lot is going to happen after the Vigilus part 2 release. Between now and then I expect them to release Genestealer Cults and start hyping up Black Legion stuff. Then we'll hit Vigilus 2 and I imagine the proverbial floodgates are going to open when it comes to Chaos stuff. Of course, I could be completely wrong and we'll have a repeat of Orktober, but it definitely feels like they're trying to hype this up for Chaos. We know the Death Guard is on Vigilus, as well as the Asuryani, so I don't know if we'll get a Killzone related to that or not. I could certainly see it. Another thing to consider is that Grey Knights and Harlequins can both be starter sets with a commander in a single box, since the main troop box you would get for them can create their commanders. My hope is that we get more treatment like Admech and GSC got and get some brand new units, but I think that would be too much to hope for. 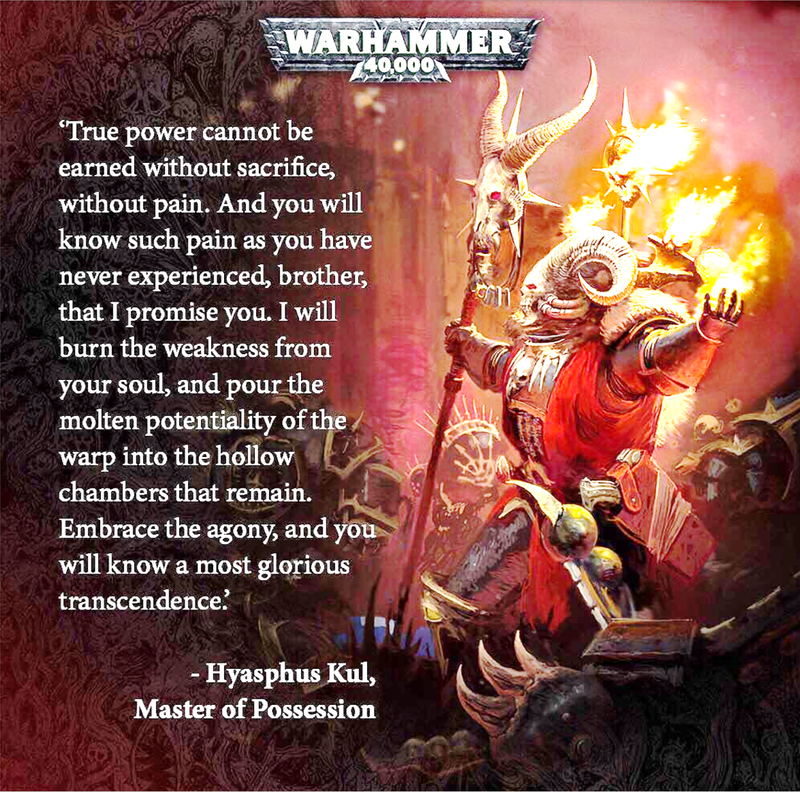 But yeah, long story short, we just have to be patient while GW hypes us up and through Vigilus part 2. There is also the Ork junkyard-themed terrain, and the Tau Tidewall stuff, so there is more xeos terrain than just the Aeldari stuff. However, they have somewhat missed the boat to release these alongside their most-suited factions, so we may have to wait awhile to see Killzones for either, if at all. The Ork debris piles and Mekboy workshop seem especially suited to becoming a Killzone. Overall though, I agree with your post. Having really wanted to get hold of that destroyed Rhino terrain piece since around the time it went OOP, I'd be all over that! I do find it odd that GW does not sell any kind of plastic craters set for the first time since I started gaming. I wonder why they discontinued the Quake craters? Those still appear in a lot of official photographs, and are fairly recent, but they had a really short sales run. Those craters are gone, huh? Completely passed me by. Maybe they weren't selling? I seem to remember them being quite expensive for what you were getting. I liked the Rhino terrain and considered buying it on more than one occasion. Never got around to it, though, so I wouldn't mind if it made a comeback myself. Likewise on the Battlescape, I had just got round to finally buying it when it went OOP, and I missed it by a whisker! Yeah, the craters have been gone for at least a year or so! I think it’s because you no longer have to place a crater when you blow up a vehicle, so not needed as a gaming accessory. That being said I still like to! Those craters they did were great. Shame they don't sell 'em any more. Then again, if they did sell them they'd've repackaged them as a "Deathfield Shatterscape" or some other nonsense name and they'd have really unnecessary rules. I dunno. I played with those craters. They were flimsy, the border edge of them was kind of crappy, and a lot of times they were warped. My local hobby store did a lot of work to make them good, mainly by trimming the border, putting a piece of cork board on them to make them flat and substantial enough to not be blown away by the fan we had to have in the corner (thanks, Florida). I think it's more that they were just old rather than not selling. GW can discontinue terrain a lot more quietly than any other models since people don't really *need* them for their army. It sounds like you mean the vacuum formed moonscape craters more than the quake cannon ones which were full cast plastic. Sign me up for a chaos tick, I feel like Abaddon will be the capstone of a chaos release if it comes, but of a standard marine kit is in the mix, that'll mean far more to the community. ... so going by dates and recent batch of FW pre-orders, only thing that remains is carrion empire. 9th ... possibly start vigilus 2? Do we know what time is the open vegas seminar today? Could be one of those tick things in the background there, in the middle. Though it also looks like new Obliterators are a-coming if the big blokes on either side of Kul are of any indication. I'm not saying it's Chaos Primaris, but it's Chaos Primaris. Hopefully new Posessed. They’ve never quite got those models right. Possessed as large as Primaris would be fine, they'd at least be in line with the 30k equivalents then. Whatever they are...I want all of it. So bye bye regular Marines, and bye bye regular Chaos Marines. The Black Legion leaning into the possession angle would fit with there old fluff. And being generally jacked up on warp stuff is a decent justification for a scale adjustment. I'm not convinced they could handle making Possessed ever worth taking, as 3 editions of rules have been totally unplayable. Good models sell but good models with great rules sell even more. They're not gonna be Possessed as you know it, more like possession powered Big Marines. So just as bad as current possessed but with awful Cawl level fluff to justify the slightly better (but doesnt matter in current edition of 40k: Mortal Wounds) stats? I'm looking forward to the 14 or so Chaos Primaris 'Dark Possessors', or whatever the lieutenant equivalent is. It would be nice if the new Possessed contained options for god specific mutations. Bird heads for Tzeentch, rotten limbs for Nurgle, etc. I worry that it'll be a lot of spikes and horns. If it is even Obliterators in the art, I don’t think we’d see new models anyways for them necessarily. But I think it is more likely possessed with how the tease is headed. Okay, well, yes, if you wanna put it that way. Ooh, exciting times. I really hope CSM finally get the big clear-up release they deserve, rejuvenate some of those horrible ancient kits and spruce up the line. I would skwee over new Obliterators. I'm actually holding off on converting some out of hope. An obliterator character to lead my obliterators would be even better. Or even just an artifact to make a chaos lord one. I've always wanted to like Obliterators- the fluff is cool, and the rules are neat, and they are not just spiky Space Marines. But the models, oh the models... those have always put me off. Is that a blue intercessor pauldron? The "tick" has a skull on the left-hand side (across from the character's staff) which looks an awful lot like one of the Rumour Engine pics from a few months ago. The one with a flaming skull within a spiked halo. The one on the left looks like a hellbrute a bit right? until they give possessed the same rules as gal vorbak, they will always be trash lol, so this new fella if he buffs them, well its like haarkom buffing raptors, a polished turd is still a turd. They've already made new big heretics without making them Primaris. I doubt "mini" heretics are going anyway. I don't really think there's anything wrong with possessed. It's just no one wants to commit to melee in that way and they'd rather pick up berzerkers. Similar, but seems to have some distinct differences. "No, it's a dark apostle!" "Jokes on all of you, IT'S NONE OF THOSE"
They're not missing a lot of the rules Gal Vorbak have now though? Pumped that CSM get some new stuff, even though I don't collect them. If GW refreshes this line then we don't don't have that many more that need a big refresh to be at an acceptable standard IMO. Btw, does the chaos tick even have any ranged weapons? I think it has some sort of blade in the front (?) but can't be sure if I make out any armaments on the sides.. The legs look pretty similar to a dunecrawler though so I hope this means we get some dark mechanicum stuff woven into the release. We don't even know if the Chaos Tick exists (although given no model = no rule & no artwork it's a good bet), so it's too early to speculate what it actually is. They literally underperform compared to every other option in an already crowded elites slot. We should see the stuff somewhere between dinner time and bedtime. Oh dear, the seminar is at 8 in the evening, so about 5 AM Friday for us. When did GW say he isn't a dark apostle or sorcerer? Oh, cool! I didn't catch that. Can you link their quote saying that the master of the possessed is not a sorceror or an apostle? Thanks! To be clear, this was asked in the comments, and the reply was "It says it's a Master of Possession", which isn't really a denial or affirmation. Not firm, anyway. They're being a bit cagey until the official announcement (which may happen tonight at LVO). options like special weapons, power weapons etc. Gal Vorbak are what possessed should be rather than the unreliable trash unit we have now that is overshadowed by every other choice. I think the seminar is at 6pm Las Vegas time, with the actual Community article going up at 9pm Eastern. My bad. I had put my local time (Eastern) in the post. The Facebook post went up about an hour and a half ago. How far off the 80 days Vigilus deadline are we? Is that in just over a week? What are we expecting at the LVO? The 80 days video was posted on December 15th, so that will be on the 5th of March. Which is on a Tuesday, which seems weird considering they release in weekend generally. Aaagh, 26 days still? Dayum, I am impatient! Until we get more info I'll just assume GW will use the rest of the week for teasers of what to expect for the following Sunday announcement. For instance, Tuesday we get a picture with sad looking Haarken and a "time's up" caption, Wednesday an animation in which a famous topknot stirs, and so forth. I don't think now that GW does their animated teasers regularly and Vigilus 2 is kind of a big release, they'll just drop a simgle one along with the "next week on pre-order" announcement. I like how it looks like its from a metal album cover. You can play powerwolf over that. So they didn’t? That’s a disappointment..
Yeah, seems more like an evasive answer. Not like it really matters, one way or another. I can't believe they picked a name like "Hyasphus" who in the world was in charge of that? Hyaspus_Kul wrote: True power cannot be earned without sacrifice, without pain. And you will know such pain as you have never experienced, brother, that I promise you. I will burn the weakness from your soul, and pour the molten potentiality of the warp into the hollow chambers that remain. Embrace the agony, and you will know a most glorious [b][color=red]transcendence. 1.We're getting Primaris marines. If that's the case, I thought Fabius would've find a way. 2.We're gonna see 9th edition. This is a preview. 3. We get an updated codex with new rules for other bands(pipe dream). 4.We're getting a Black Legion HQ that only affects Possessed and Spawn, and a new way to play 40K. I don't understand. What's wrong with that name? I think it would make sense to drop new chaos cultist model reveal today + maybe chaos guardsmen full kit. If its tied to vigilus these would be the first waves rising up before the Black legion fully arrives. On chaos primaris marines, I think this depends on what they do with fabius' character. In the novels he is still very torn about helping to rebuild the legions (despite trazyn trading him a huge stock of EC geneseed in return for his perfect mint condition uncorrupted fulgrim clone) He still seems very set on focusing on his new men instead of messing with more marines. I think fabius actually would work well as a kill team release with 1-2 of his apothocary friends and his gland hounds (would also be the time they make the model for the female "space marine" who hangs out with him. Although he seems against helping out chaos legions anymore the eldar in books do seem to be pushing him towards rebuilding the emperors children as part of some grand story of the harlequins. They posted the full image. It's listed as "Shadowspear". Then, after the FAQ, it will only affect Black Legion Possessed/Spawn, and then after another FAQ, back to affecting anyone's Possessed/Spawn. I wish all the Rievers had helmets like that fellow in the front, there. So NOBODY is going to call out Primaris-ized Telion? I see a rumor engine claw! New Chaos Space Marines. Sisters of Battle. The next chapter in the Soul Wars. And much, much more. Looks like a new helbrute in the back there. And that Marine with the habit and sword looks like a psyker... Namely because if his talisman. Chainaxe welding chaos Marine in the middle by the helbrute ..
Oh, and the sweet looking possessed in the foreground. Sp00der tank?? New oblit/helbrute/whatever? New possessed.. hype increasing! It looks like Telion. Just what everyone wanted, more unique Ultramarine characters. Gag. The rest looks awesome though. I reckon the Hellbrute is actually an obliterator (this time in plastic). New possessed at the front. Hints at redesigned normal can too. I wouldn't mind more CSM characters, as long as they are usable. How often do we see Lucious, Fabius bile, etc being used. Probably only Abaddon sees use. 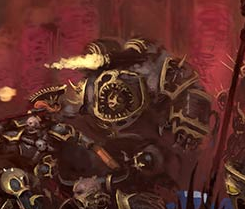 I dunno, the helbrute/oblit thing has the "tiny head in a fanged maw" and a big honkin fist. The top mounted "minigun" could mean a redesign or plastic oblits, and they just started to look more like the helbrutes. Dude in the front looks uncannily like GSC Chaos Marine. Did armless recruited some in hopes their genestock can repair his condition? And not, because of you know, his psychic hood? I thought we would be able to watch the livestream by now. Any ideas what is going on? And where? No, we don't get a livestream. GW themselves will put up the slides/photos from the reveal after it finishes. Oh well. Time to hurry up and wait. Thanks! I honestly didn't see it. Too much blue in that picture for my taste. Needs some yellow Fists or BLack Templars. Just keep following here for it. Also, primaris dude in front has not only new, very stormtrooper-y helmet, his backpack has comm equipment too. Looks like DG and GSC flood of characters really sells. Reiver is weird, too, not only new helmet without speakers, but the grenades were replaced by some sort of electronic equipment. Stealth squad as opposed to screechy boys? We're at least getting Chaos Space Marines and Sisters of Battle. It's in the title tag for the page. I'd imagine Dark Oath for AoS, last 2 Warbands for Nightvault, and probably a tease for Slaanesh at the end. Also, sprinkle in Blood Bowl, Necormunda, etc. Too small to be a dreadnought or hellbrute. The Librarian looks pretty weird. He's got gloves and what looks like the tunic and belt from the Rumor Engine on. I know they usually have robes, but a tunic is new. I was looking at around the head and it reminds me of the contemptor chassis. The primaris in the pic all have the same armor as reivers and grav chutes, but stalker bolt rifles and different helmets/comms backpacks. Even the lib has that style of MkX. You have a problem when you download an extension to have it auto refresh a page after 15 seconds. Its too small to be a contemptor could be a possessed / obilterator. 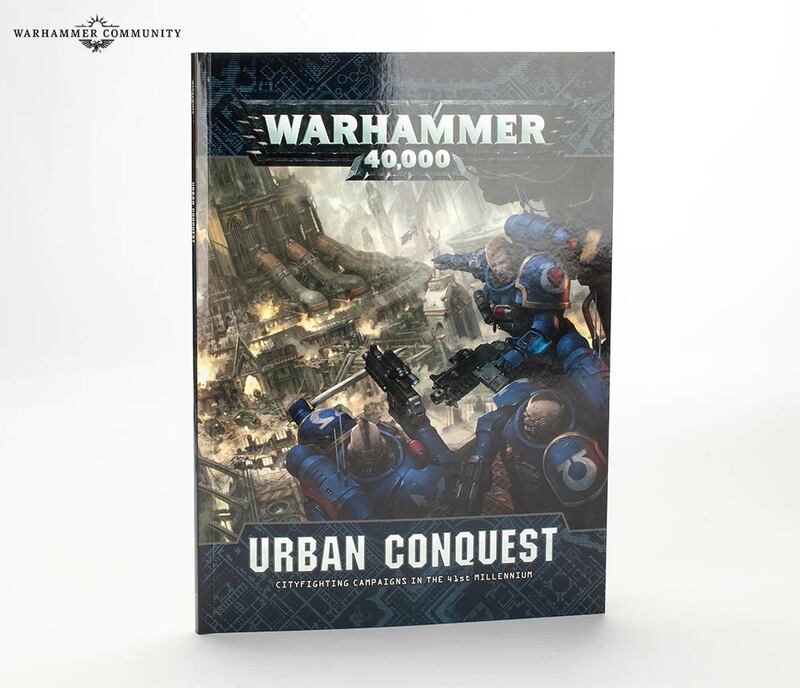 Fun fact, it looks like the "Intercessors" on the front of Urban Conquest...weren't. The "Captain" seems to be Telion, Primaris'd. These are completely normal, bog standard bolt carbine Reivers in literally every single detail. "Intercessors"? What? Those are clearly not bolt carbines tho. They're bolt rifles. Carbines have the fore-grip and no scope. On the community webpage. If you do a Ctrl+U it shows the meta-tag "Abbadon" amongst other things. At this point, I'd say an Abbadon reveal is a given. Did anyone see that funny looking gun the Marine s using behind the sword of the psyker? Looks like a multibarrel bolter of some sort. 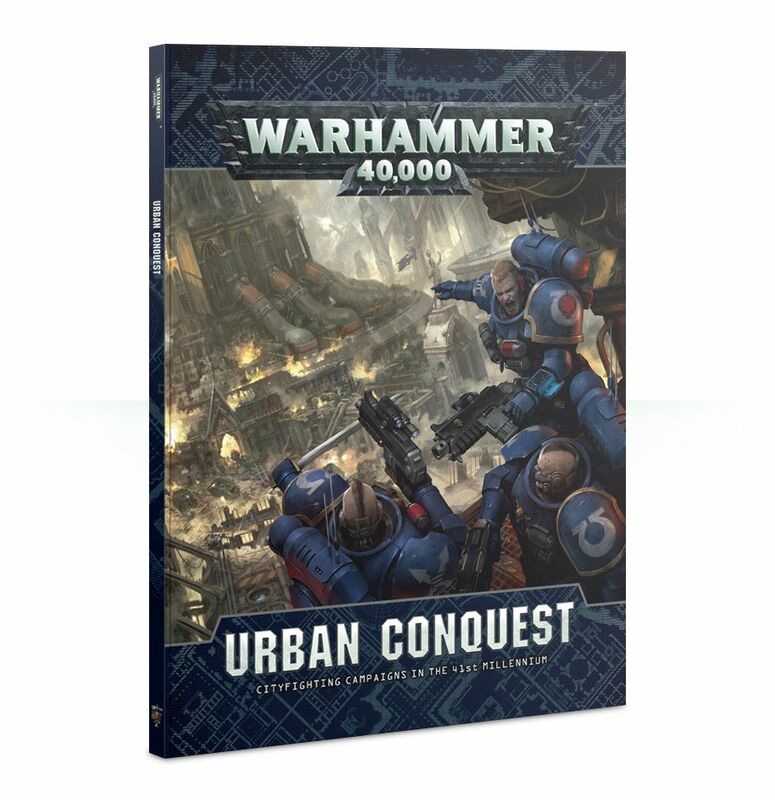 I wonder if this will end up being a boxed set with new Primaris and black Legion, like the Naeve box from AoS? Interesting, I just went back to the site and did the Ctrl+u again... and Abbs is no longer one of the tags. With the fist, the maw, and the fleshy bits it looks too close to a hellbrute, I don't think they would make a model look that derivative. Might be a new hellbrute kit, because the current one is how old now? Or it might be a named hellbrute character, which would be interesting for chaos to finally get a character dread. The artwork looks like it would be Telion, a Librarian, and Reivers against The Master of Possession, Possessed, CSM, plus the Tick and Obliterator thing. Definitely feels like the contents of a Starter set, compared to a boxset. edit: and after a couple of refresh, it's gone for me too ... GW is watching us!!! sylvaneth warband for Warhammer underworlds, nice. They usually release them in twos, so maybe we get the duradin warband as well? Man if Primaris get scouts that would pretty much be the final nail in the micromarine coffin. So I hope it is true lol. I missed the first part but I'm here. Some box set I missed, new primaris vs chaos. Abaddon in 26 days. It also looks like a new type of mark x gravis armor, wielding some kind of assault cannon like weapon. It has the gravis shoulder pads and bulk but the chest and head are different. 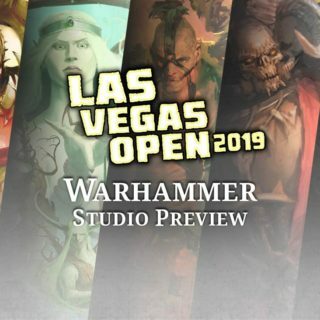 Well Blades of Khorne is in those tags, plus there is a Bloodletter pictured in the background banner on the LVO teaser from GW, so I would guess they have a faction coming for Shadespire along with Sylvaneth. It looks to be exactly the same as all the other stalker bolt rifles in the drawing honestly. count the barrels, looks like there are six. Looks like 1 to me. It's just so far in the background it looks weird. page is updated, all new sculpts in shadowspear, and they preview the new abaddon model at the bottom. My god, the obliterator is beautiful. The tick is real, I repeat...the tick is real. I like it a lot. Nice joke about the reveal. I smiled, although it was an obvious joke on the way into to]he video. So that's 5 new CSM sculpts counting Blackstone fortress? Here's to hoping that'll mean a full new multi-part box for them soon! This stuff all looks great. Hopefully CSM gets some rules fixes too, but i'll probably collect this stuff even if they don't. Personally, though, I'm most excited about that incredible new librarian and snipers! GW just trolled the gak out of the community with that new lieutenant. The new Abbadon in the video is looking slick! Pretty great video. It's good GW can laugh at themselves. Looks like all my scouts are being junked. There’ll be more than three in the box I’d have thought. As they said that’s not all the models in it. And looking at the other boxes they’ve done, normally quite a good model count. 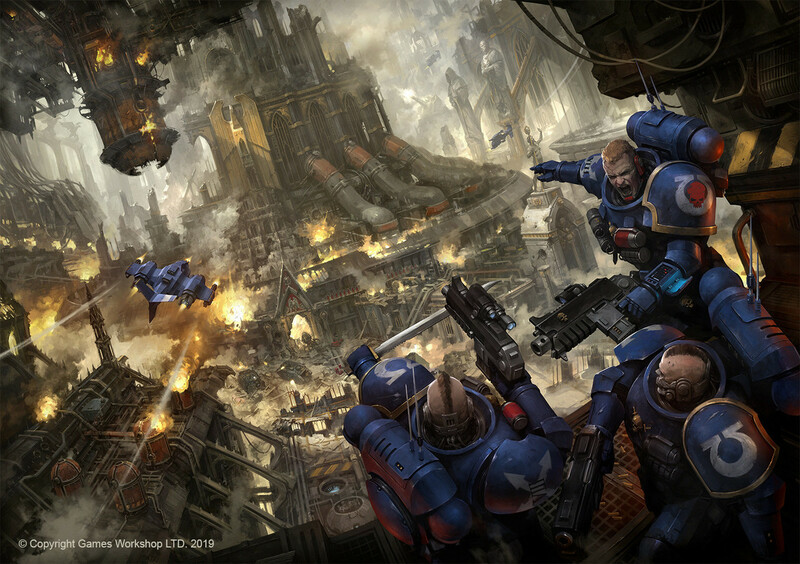 We are still missing some of the imperium side, they revealed the sniper and the librarian, but there should be two other units, one of them probably heavy to counter the new obliterators. I am mostly happy that Games Workshop has mostly shown they are updating the Chaos Space Marine models rather than making a Primaris equivalent or some other new fangled unit. I have no issues with the shown new marine sculpts and even quite like the Obliterator model. I can take or leave the vemoncrawler, but I am sure someone will like it quite a bit. All that chaos stuff is on point. Glad I held off on converting new oblits for my BL. Damn, I like the new primaris libby a lot too. I like the leather details, it adds a cool renaissance vibe like the custodes armor has. Needless to say GW is aware of the meme. Love the look of the new chaos but if they are monopose again, not buying them, the tick is very nice, Abby looks good from what we've seen, chaos marines look as they should (with above caveat), the obliterator thing looks like total crap though... Total swing and a miss there, just looks like a hellbrute with a couple extra guns. The librarian could totally pass for a primaris Ezekiel-he even has keys! I really like these new primaris. Can’t wait to see what else is in the box. I like the new Primaris models a lot, but then, I'm one of the only people in the room cheering when Sigmar opens a new chamber too. I'm glad I didn't bought more sniper scouts. They improve a lot when you put Tempestus helmets on them but... those are just much better. GW drops another box set with sweet new models. Thankfully I'm almost done painting my Space Marines and might even have some money by the time this new release drops. Good stuff, nice to see GW playing along with the Primaris lt. I have changed the title of the thread to reflect its contents better. I'm half expecting that Games Workshop will also do a Kill Teams release right alongside Shadowspear. I mean, the new Kill Team boxes have included a Commander and a unit of guys. It's easy enough to come up with an idea of what the Primaris box would look like: the Vanguard Librarian and a squad of the Vanguard Primaris. Not sure what the Chaos Kill Team would look like. Also suddenly made a pretty hard about face in regards to Oblits. This must be one of the most drastic model updates ever in terms of replacing a bad sculpt with a decent one. Kinda sold on The Tick too. Still not sure a new Abby can bring me over to the Black Legion though. There is an extremely high chance those Chaos models will be joining the World Eaters! As with all the Primaris stuff so far the fluff does nothing for me, but the models have a lot of potential. Somebody at GW really does have a fetish for the word "Vanguard" though. The Chaos kits look lovely, but still too titchy for my taste. I think I'll reserve judgement on the new Oblits. Will there be a vanguard unit called a vanguard that vanguards the vanguard or will the vanguard vanguard the vanguards while vanguarding the vanguard? The VIth called, they want their schtick back. I'm most curious to see how over the top (figuratively and literally) Abby's hairdo is. Gobsmacking work again by Gdubs, everything looks great. Only issue I have with is fluff-wise, since the description for Vanguard seems very similar to what Reivers are supposed to do, just less emphasis on terror tactics and more on infiltration. It'll be an over-the-top knot. Its an expansion on the reiver, same armour, including Librarian. This was mentioned in the seminar. Well that all looks great, cant wait to see what else is in the box. I guess these Vanguard Primaris are the Scout company's replacement? The non skull helmed "Reivers" with tactical markings and the guy at the back with a servo skull in the artwork especially intrigue me. If GW are going to expand the other MKX armour variants then I really think its time to start revising that fluff about chapter size limits before they paint themselves into a corner. I got hard watching the preview for the Abigail reveal. I hate bling to death, but that's gonna be a gorgeous model. I'm honestly a little off-put by the new Obliterator design. More than the Helbrute face-in-a-maw thing, it's the overly fleshy thighs. The spider-tank, though? Now this... THIS is what a daemon engine should look like: the stuff of nightmares made manifest into something not quite monster, not quite machine, but something more horrifying than both. They look monopose but hopefully they'll have some customization? Paint the thighs non-fleshy then? If GW lets us throw the guns wherever I'd say that it was a victory. Seems like a path to open up new primaris options on the regular, which helps with preventing stagnation with the #1 army. Not sure if it has been pointed out yet but there will be new possessed in the box as well. 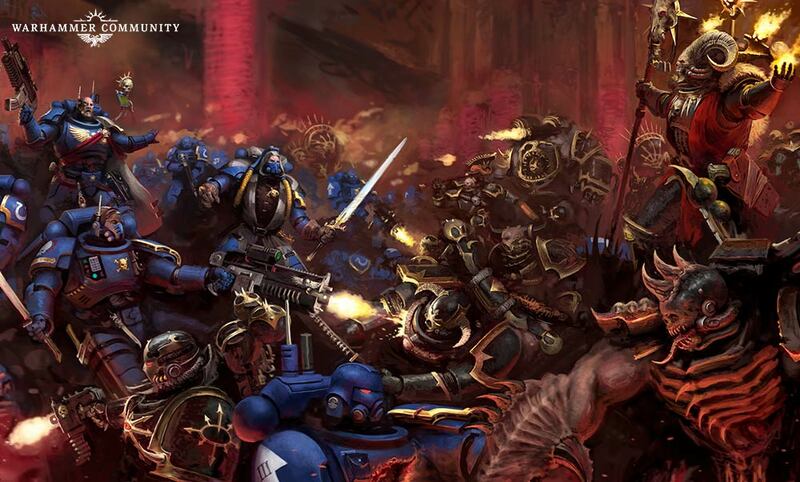 Absolutely love that CSM are going to the more baroque look first seen in Dark Vengeance. Been a long time coming, but seems Chaos is getting some much needed love. In the Shadowspear video there look to be some APCish shapes behind the librarian-I don't recognize the silhouette, but they do look to be grey, and I think you can see a large wheel. There is one in profile behind him and another front-ish on to the right in the picture. Who would have thought that after all these years we would at last receive a proper Dark Vengeance style Chaos Chosen release. They said all new models sooo....a wheeled transport like the current USArmy Stryker? maybe a new landspeeder "storm"? I'm trying to guess model count. Somehow they manage to make Obliterators dumber with every resculpt. Chaos Tick looks amazeballs and I want the world's entire supply of them. A new Primaris "Chamber" is a hard pass snorefest for me. Finally obliterators I actually want to buy. These are the best ones they have made. Glad I waited for an update. probably Primaris Telion and Abaddon will also be featured on the set. Personally, I think the obliterators look terrible. Everything else looks amazing though. The Venomcrawler is the best demon engine they’ve done so far. So much better than the old dinobots. I quite like the venomcrawler. To rip it appart and build something else. The obliterators are i dunno, some parts look fantastic some of them just eugh. I still prefer the chosen from the older box to the new marines. I still want a propper cultists / traitorguardsmen box before a daemon engine. I'm not so much into the fleshy parts of the Obliterators. But beyond that they're pretty cool! No i seriously don't like it, the only thing i am interested in is it feasble to form it into either A Dark Magos or something else. I feel it is just done ugly. I'd like a destroyer Cult sidegrade with smaller oblits, mutilators and Oblits as the big meanies. That said what do people think about the master of possesion? He has supposedly synergies with daemons. That might become problematic . Kind of disappointed by lack of any mention of close combat Primaris, my Primaris Black Templars are in desperate need of some dudes with swords. Those oblits are darn tasty. Not totally sold on the tick, probably at least lop of its tongue - looks a tad silly. I really wish they went back to the "metal men" concept for Obliterators instead of doubling down on the crappy "Terminators with cancer" reimagining. Took them three tries, but they finally got Obliterators right! Basing then on Centurions was a bit of a no brainer, but it seems to work. Spider tank is awesome, and that Librarian is glorious. This Ninja-Librarian is the best Librarian Model they have ever released. Maybe is because I'm biased as a Dark Angel player but I never liked librarians because they didn't had helmets and those psychic hoods and pool-hats where really silly. The Primaris Librarian was the first Librarian I liked because he had an helmet but this one? Is so ninja and edgy. The hood, the pose, the sword, the rebreather, the leather gloves. He looks like hes gonna teleport behind you and say "Nothing personal, xeno scum"
Oh gods no. Those were awful! Also, wondering that if this is a dual kit with Mutilators, what the Mutilator shoulder Weapons might be?